Jesus had just foretold His crucifixion and resurrection a third time when James and John approached Him with a request. They wanted to be His right- and left-hand men when He came to glory. They had no idea what they were asking for. Meanwhile, the other ten disciples hear about the brothers’ impudent desire and start haranguing about it. Clearly, they thought that they had equally valid claims to be elevated once Jesus fully ushered in His kingdom. That’s when Jesus calls for a huddle. He says that the greats among the Gentiles (to be read here as, the fallen world) lord their authority over others. But, Jesus says that’s not how things go in the kingdom of God that He has brought into the world. Listen: What’s interesting to me as Jesus explains what it means to be great in His kingdom is that He doesn’t put down the desire to be great. Instead, He redefines greatness. 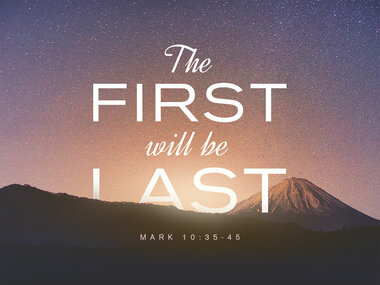 “...whoever wants to become great among you must be your servant, and whoever wants to be first must be slave of all.” Then Jesus says that we must take Him not only as our King and Savior; we must also take Him as our example: “For even the Son of Man did not come to be served, but to serve, and to give his life as a ransom for many.” That phrase, Son of Man, references Jesus’ deity, His status as God enfleshed. Although Jesus has been given all authority (Matthew 28:19), He doesn’t lord it over people. Instead, He became a servant: becoming human, subjecting Himself to human limitations, death, and temptation, washing the disciples’ feet, dying for the sins of the world. 7 rather, he made himself nothing by taking the very nature of a servant, being made in human likeness. Aspiring to greatness is not a bad thing. But we must redefine our understanding of greatness. Greatness is achieved not be ascending above others. Greatness is something to which the human ego, human pretensions, and human sensibilities must descend. In the Kingdom of God, the way up is the way down. To be great in God’s eyes and God’s kingdom is to dare to be a servant of others, to not toot our own horns, to not tell stories about my life in which I’m the hero, to not try to be the first one in line, to not resent others’ success, to not seek affirmation or accolades from the fickle world, to not put other people down in order to lift myself up. It means to honor God, to share Christ, to show consideration and respect to others no matter how we may feel about them, to pray for those who rub us the wrong way or who have done us wrong, to pray for those we don’t understand, to help the poor, the despised, the neglected, to surrender all to Christ. This is daunting. Even when I seek to be a selfless servant, I often find myself thinking, “Wow! I’m being a selfless servant.” That’s hardly the thinking of a selfless servant. God can save sinners like me. He can transform the self-absorbed into the selfless disciple, if my ambition is to be great in the eyes of heaven and not in the eyes of the world. Knowing God’s grace and my own depravity, I would even say that if I want to want to be a selfless disciple while the old Adam is still saying, “Not really,” God will bring His transforming grace into my life and transform me. I simply need to let Jesus in, to ask Him to work on me, to fill me with the Holy Spirit, to crowd out the old Adam in me with Himself, and to shut the old Adam down, to tie him up, and to destroy his power, as well as the power of the devil and the sinfulness in the world, over me. If I aspire to greatness in the kingdom of God, I must daily repent and daily be renewed by the power of God’s saving Word and His Holy Spirit’s life-giving power. Sometimes I want this; but, Lord, I do want to want it. Since I’m giving you that inch into my life, please, Lord Jesus, take a mile! Take all of me!